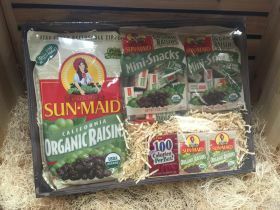 A collection of all of our Organic Raisin products nestled in a wooden tray. Two Organic 6-packs, two Organic Minis, and one 2 lb. bag of Organic Raisins.